Shards of stained glass from priceless medieval windows. A gaping hole above the choir area where the spire crashed down. Charred debris from the collapsed roof scattered on the ground. 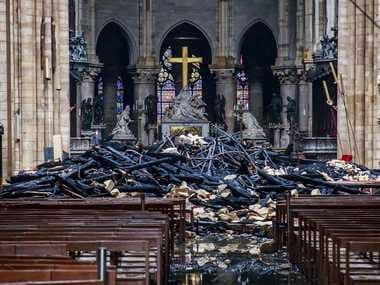 After firefighters put out the last remnants of the fire that ravaged Notre-Dame cathedral in Paris, daylight revealed the extent of the damage caused by the blaze Monday evening. Tourists and Parisians, united in their shock at the damage to one of the great monuments of human heritage, watched from the safety of the opposite bank of the Seine, kept away by a police cordon. But journalists could witness the extent of the damage through one of the great doors which opened to reveal the piles of rubble and charred debris inside. But in a luminous sign of hope, a golden cross was still intact at the back of the cathedral, shining defiantly in the gloom. Intact stained-glass windows and statues could also be seen, though sculpted arches were blackened by smoke and pews destroyed. Cathedral clerics who saw the damage to the interior said they were struggling to believe what they witnessed. Philippe Marsset, the vicar general of Notre-Dame, was among the first to enter the cathedral. “It felt like I was looking at a bombing,” Marsset said of the cathedral, where he was ordained a priest 31 years ago. “It was hell,” he said, describing the moment when the blaze was discovered on the soaring roof shortly after evening mass ended shortly before 7 pm (10.30 pm IST) on Monday. Church officials raced to remove as many artefacts, paintings and other cultural treasures as they could before being evacuated by firefighters trying to stop the flames from spreading. But the blaze kept springing up as globs of molten lead fell from the soaring heights of the church. “All night long I saw men going past with tears in their eyes. I described it this way: It was total chaos, but we can’t let it knock us down,” Marsset said. “This church was built 850 years ago. It withstood the wars, it withstood the bombings, it resisted everything,” he said. Onlookers from France and abroad remained transfixed by the sight of the cathedral, relieved that its main structure had been saved but worried about how it could be rebuilt. Aurora, 33, an Italian living in Paris for the last half-decade, said she had jumped on her bicycle before dawn “like paying tribute to a sick elderly parent”. “Notre-Dame, it’s like the Eiffel Tower, it’s like my grandmother. It’s like the Colosseum in Rome had burned down. I had to go,” she said. But onlookers also worried about how the spirit of the building could be kept through a restoration. “Those who built it are no longer with us. Do we know all its details, all its secrets?” asked Christelle, a 27-year-old Congolese student. But in the end there was relief that a lot was able to be saved, with much of the stonework as well as the two massive square bell towers largely unscathed. “We’re all just dumbfounded. It’s more than miraculous, it’s heroic,” Marsset said, calling the firefighters who toiled throughout the night “heroes”. But he appeared lost for words when asked about what would happen now, as Christians worldwide prepared to celebrate Easter next Sunday. “We had things planned for Wednesday, Thursday, Friday. We don’t yet know where to do these. It’s as if our mother has been wounded,” he said.